Artist’s concept of ESA’s Trace Gas Orbiter, part of the ExoMars mission, analyzing the Martian atmosphere. Image via ESA/ATG MediaLab. 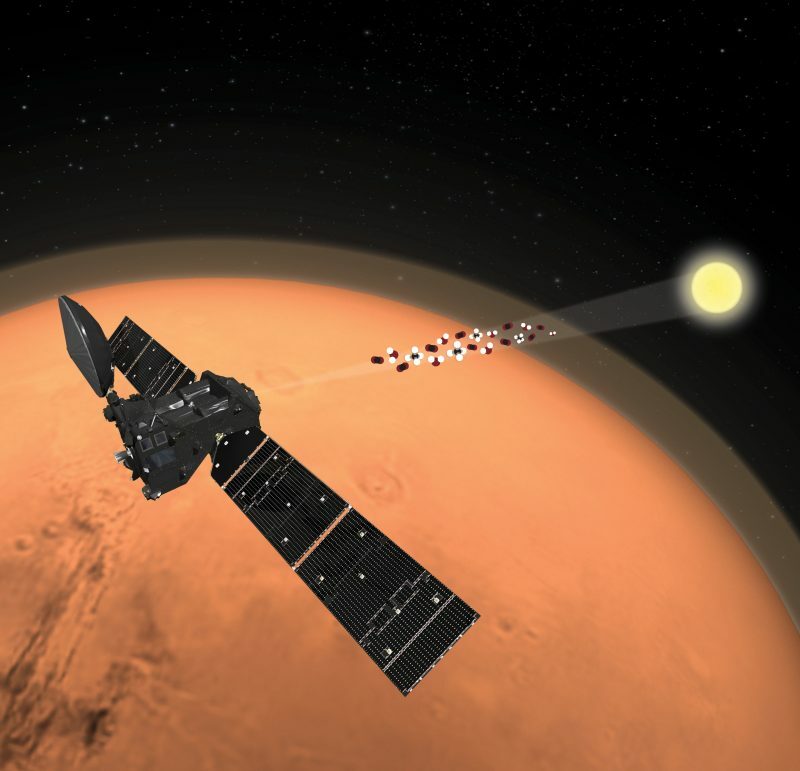 Ten days ago, we spoke of a June 2013 detection of methane in Mars’ atmosphere by both the ground-based Curiosity rover and the Mars Express orbiter. 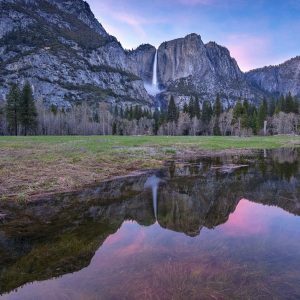 Scientists were excited about that because, on Earth, methane is generated by living organisms, as well as geological processes. So Mars’ methane might hold clues to possible life on Mars. 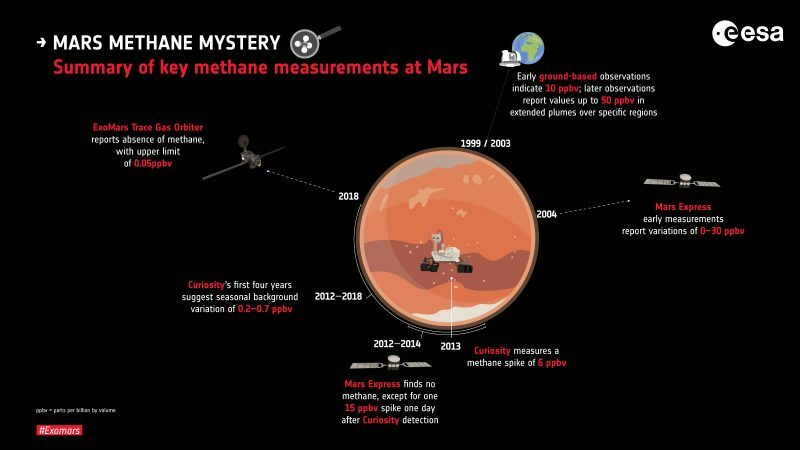 But now another group of perplexed planetary scientists is asking … where has Mars’ methane gone? 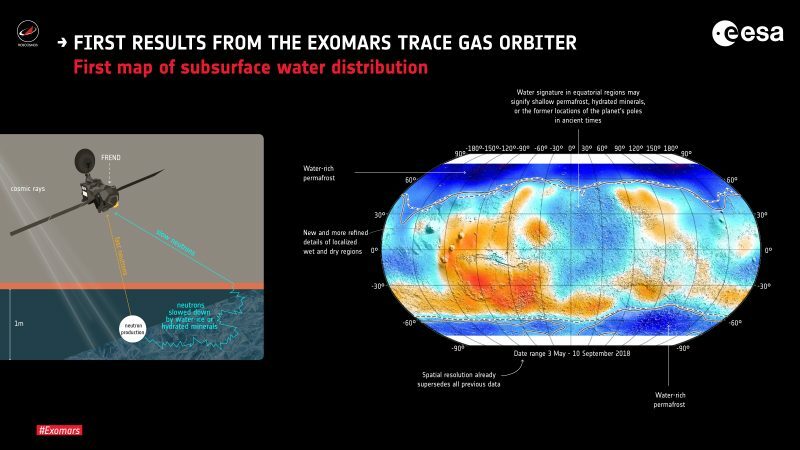 The first results from ESA’s Trace Gas Orbiter (TGO) – part of the ExoMars mission, which launched on Mars in 2016 – showed virtually no signs of the gas in the Martian atmosphere. This is surprising, to say the least. TGO also has some new findings for scientists about dust in Mars’ atmosphere and subsurface deposits of water ice and water-related minerals. The puzzling methane results were presented at the annual meeting of the European Geosciences Union last week in Vienna, and a first paper was published on April 10, 2019, in the peer-reviewed journal Nature Today. A second paper, also in Nature Today, discusses the impact of the recent global dust storm on water in the Martian atmosphere. A third paper (in Russian), submitted to the Proceedings of the Russian Academy of Science, provides the most detailed map ever produced of water ice and hydrated minerals in the shallow subsurface of the planet. 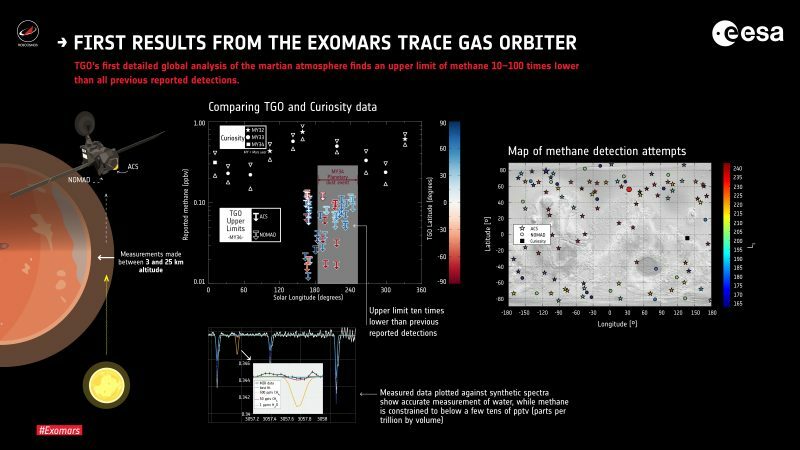 So far, TGO has found an upper limit of methane in the Martian atmosphere 10 to 100 times less than previous detections. Why? Image via ESA; spacecraft: ATG MediaLab; data: O. Korablev et al (2019). We have beautiful, high-accuracy data tracing signals of water within the range of where we would expect to see methane, but yet we can only report a modest upper limit that suggests a global absence of methane. Earth-based telescopes had previously found transient measurements of up to 45 ppbv, while Mars Express found a limit of 10 ppbv in 2004. The Curiosity rover found a background level of methane of 0.2 – 0.7 ppbv, with higher periodic peaks. Our story from a week ago reported that Mars Express had confirmed one of Curiosity’s largest peaks in 2013, narrowing down the location of at least one methane plume down to east of Gale Crater. A history of key methane measurements on Mars from 1999 to 2018. Image via ESA. The upper limit of 0.05 ppbv amounts to about 500 tons of methane overall, but that is actually a very tiny amount when it is spread throughout the entire atmosphere. The TGO’s high-precision measurements seem to be at odds with previous detections; to reconcile the various datasets and match the fast transition from previously reported plumes to the apparently very low background levels, we need to find a method that efficiently destroys methane close to the surface of the planet. Just as the question of the presence of methane and where it might be coming from has caused so much debate, so the issue of where it is going, and how quickly it can disappear, is equally interesting. We don’t have all the pieces of the puzzle or see the full picture yet, but that is why we are there with TGO, making a detailed analysis of the atmosphere with the best instruments we have, to better understand how active this planet is – whether geologically or biologically. 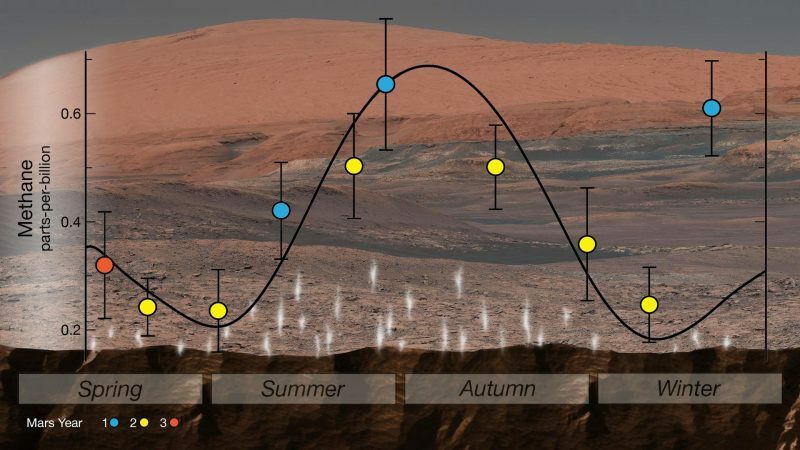 Diagram showing the seasonal cycle of methane as detected by the Curiosity rover in Gale Crater. Image via NASA/JPL-Caltech. Methane is of primary interest to scientists studying Mars, since it can originate either geologically or biologically. On Earth, by far most of the gas – about 95 percent – is produced by living organisms, but some also is created by geological activity. We still don’t know the origin of Mars’ methane, but the Curiosity rover did also determine that it is seasonal in nature – increasing in summer and decreasing again in winter – which may explain why it hasn’t been found yet by TGO. Current evidence also points to the methane most likely coming from beneath the surface. That could fit in with either a geological or biological scenario, or perhaps even both. In the northern latitudes [of Mars] we saw features such as dust clouds at altitudes of around 25-40 km [15-25 miles] that were not there before, and in southern latitudes we saw dust layers moving to higher altitudes. 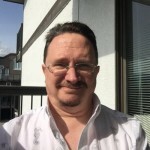 The enhancement of water vapor in the atmosphere happened remarkably quickly, over just a few days during the onset of the storm, indicating a swift reaction of the atmosphere to the dust storm. We see that water … is very sensitive to the presence of ice clouds, preventing it from reaching atmospheric layers higher up. During the storm, water reached much higher altitudes. This was theoretically predicted by models for a long time but this is the first time we have been able to observe it. 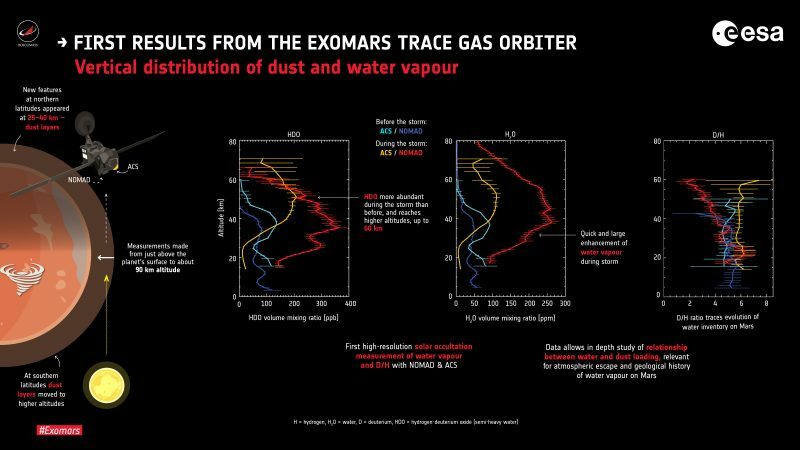 TGO observations of how dust from the recent global dust storm has affected water vapor in the Martian atmosphere. Image via ESA; spacecraft: ATG MediaLab; data: A-C Vandaele et al (2019). In just 131 days the instrument had already produced a map that has a higher resolution than that of the 16 years data from its predecessor onboard NASA’s Mars Odyssey – and it is set to continue getting better. The data is continually improving and we will eventually have what will become the reference data for mapping shallow subsurface water-rich materials on Mars, crucial for understanding the overall evolution of Mars and where all the present water is now. It is important for the science on Mars, and it is also valuable for future Mars exploration. We need to be more patient with TGO, because one thing we have learned is that the methane story is full of surprises, and there are surely more to come. It would not surprise me if TGO detected methane sometime in the future. Want more detail? There’s a good overview of the new methane findings in a new article in Nature. Map of shallow subsurface water (hydrated minerals/ice) distribution on Mars. Image via ESA; spacecraft: ATG/medialab; data: I. Mitrofanov et al (2018). Bottom line: The origin of Mars’ methane is still a mystery, but now its apparent vanishing act is in itself another puzzle for scientists to solve.